My fascination for watches began very early and still shapes me today. My first timepiece was an OMEGA Speedmaster, the first watch on the moon – or as Neil Armstrong so beautifully put it: “This is a small step for a human being, but a huge leap for mankind. My mechanical watch is still part of my small collection today and will remain so forever. Almost every mechanical watch we know is made in Switzerland. There are only a few manufactories in Germany (region Glashütte), that are able to compete with us. The timepieces of well-known brands such as OMEGA, Rolex, Breitling, etc. are all made in Switzerland – including the Eta and Valjoux movements. In 2017, we exported watches with a total value of almost CHF 20 billion*, an impressive figure that shows just how important the watchmaking industry is to us. 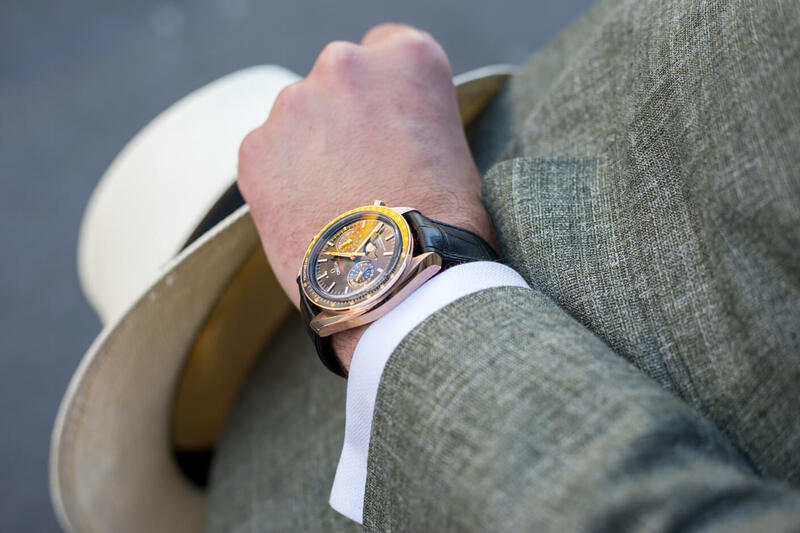 I don’t feel complete without a mechanical watch on my wrist, something is missing – that’s why there are 10 good reasons for a mechanical watch today. Whether classic and elegant with a suit or something more sporty in your spare time, the watch completes every outfit. There’s no question about it: a watch stands out. How often have I been in conversations with enthusiasts – a timepiece is passion. If you take care and revise it regularly, a mechanical watch will accompany us for the rest of our lives. After our beloved timepiece has accompanied us to the end, it can still be passed on over generations. Watches are not just there to tell the time – they are also a piece of history. Perhaps we associate them with aviation, diving, motor sports or a personal experience. It’s incredible what it takes to make a working mechanical movement. A watch manufactory is a kind of perfection, a peak performance in its form. Usually we associate a watch with an event, a service or a memory – this makes it a very personal treasure. Each time I enjoy looking at the time anew and it feels 1000 times better than the smartphone. How often have we sat over a meal, a good glass of wine or a cigar and chatted about our watch stories? You buy a Smartwatch, it’ll be junk in two years. Mechanical watches last for years and are never out of fashion. What if I have less budget than 10’000 CHF?